So your boss just told you it’s your turn to plan the office’s annual holiday party. No need to enter meltdown mode, Parties That Cook is here with our best Corporate Christmas Party Ideas! Forget trust falls and awkwardly themed office parties (though we do love a good Lady Gaga theme). When thinking about a great year end party, consider a hands-on experience! Sure, staff dinners and after-work drinks are fun, but the holiday party should be more than that. You want to plan something your coworkers will be talking about far into the new year! 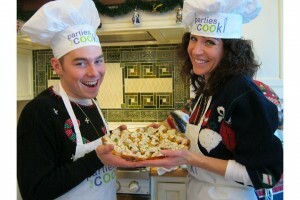 Cooking Parties are a great option for last-minute holiday parties. The holidays are all about that warm, fuzzy feeling we like to call camaraderie, and a hands-on group project like cooking dinner for yourselves gets people involved and builds teamwork and camaraderie fitting for the season. Having been in business for 12 years, we’ve learned a few things about throwing the BEST holiday parties. Here are 5 Corporate Holiday Party Ideas and tips that will help turn your get-together into a party – fast. 1. Theme – When it comes to selecting a theme, the simpler the better. This may be a work function, but it should NOT feel like work! There’s no need to try to incorporate 4 themes in one night (e.g. an ugly sweater potluck where all the food has to be red or green, and vegetarian), and there’s certainly nothing wrong with hosting a classic “Holiday Party”. 2. Venue – There are a few things to keep in mind when selecting a venue. Group size: Will everyone even fit in Michael’s 1 bedroom apartment? Will the party of 10 be swallowed up in the company warehouse? 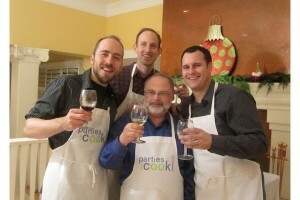 Parties That Cook works with dozens of venues for all group sizes, so you know you have options. Convenience: How far is it? Do guests have to plan to leave work early to get there? You want guests to want to come; don’t intimidate them with a long drive. Budget: Can we afford to rent an event space? Maybe the office really can accommodate our 25 person team. Parties That Cook often works with groups on a budget. Hosting the event in-house is a simple way to stretch those party dollars. Weather: Booking an expensive venue with a gorgeous outdoor patio does nothing for you if it’s snowing. 3. Menu – Seasonality is key. Be sure to pick dishes with ingredients currently in season. While it can be done, finding adequate substitutes for out-of-season ingredients can be quite the hassle (which is why Parties That Cook creates new menu options for each season). Also, remember that there is such a thing as “too many cooks in the kitchen.” Consulting everyone on the menu might result in a menu that doesn’t mesh well, or no menu at all. Parties That Cook event planners work with one individual when selecting a menu, and are well versed in which dishes pair well with others… Do be sure to make note of dietary restrictions, however! Vegetarians, vegans and any other dietary restriction are always welcome. It may help to be put these individuals on the team making a dish involving special preparation. Check out our holiday menus for inspiration! 4. Decorations – Adding special touches to the dining table and around the event space is a great way to incorporate a theme! At Parties That Cook, we’ve also found that simply placing flower arrangements as center pieces or accents here and there can make a beautiful difference in the ambiance. 5. Extras – Giving little holiday gifts to employees (about the same as a stocking-stuffer) is an affordable way to add something special to the evening. 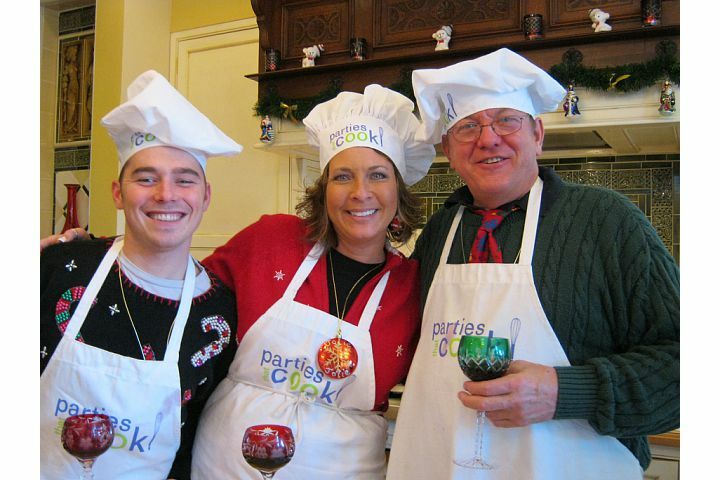 Parties That Cook offers a variety of holiday gifts as event add-ons. Sometimes it’s a helpful cookbook or a useful cooking utensil, other times it’s little personalized chocolates with the company’s logo — the sky’s the limit! You can even put a fun twist on your party and consider adding a White Elephant gift exchange! Each guest randomly selects a gift (stealing is allowed), the stress of getting a gift for a particular person is avoided, and you can set the maximum gift price! Either way, guests walk away with even more than just fond memories. On a budget? You’re in luck! We’ve dug up this gem of a blog from 2008 with helpful tips to Save Your Holiday Party from the Ax! 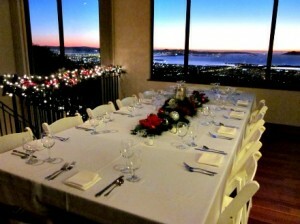 We hope this blog helped give you some ideas to get your last minute corporate holiday party going! It may be late in the year, but we still have some December dates available for your corporate team building event or holiday party. Hope to see you in the kitchen soon!